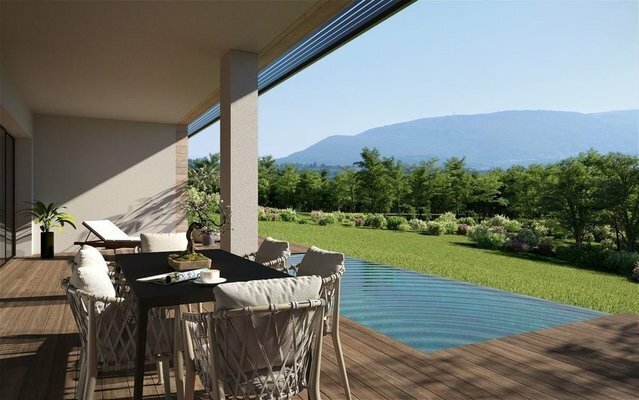 Located very close to the Swiss border, this high-quality villa is in an extremely calm area with outstanding views. The hand-picked fittings chosen by PORCELANOSA, expert in luxury fittings, add to the refined and harmonious atmosphere. All on one floor, there are 3 beautiful fitted suites, including a parental suite with dressing room, a laundry room and an office. A large double lounge approximately 60m² directly overlooks a large terrace, the garden and optional swimming pool. Well-lit with large windows, the combination of « villa-apartment » offers a unique comfort of living, with the Geneva countryside in the background. Completely enclosed and secured residency with a magnificent landscaped garden, double garage, garden with large sunny terrace – optional swimming pool – private gate with parking area and visitors’ area – Videophone – reversible underfloor heating system (winter/summer) The highlights of this prestigious property: - Exceptional domain, close to Geneva - Very bright with large windows - Refined and harmonious atmosphere - Fabulous views - Private residence - Large terrace with possibility of swimming pool De Meyer Immobilier | Sotheby’s International Realty, your expert in sales and rent of luxury property in Annecy and its surroundings.